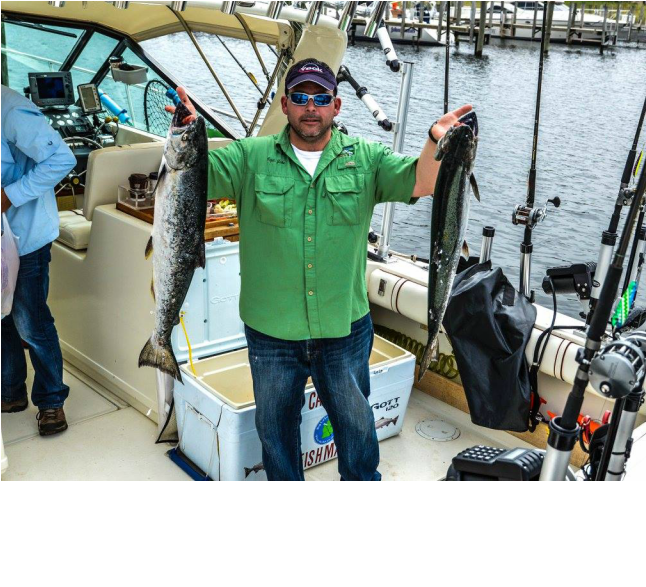 Captain Jake has his 50 Ton Master Captain License and is available afternoons and weekends to take you and your family/friends out for an exciting day/evening of fishing. I have been salmon fishing since 2004 and decided to obtain my captains license in 2013. Currently I operate a 1989 Tiara 31 Open. Fishmael III is a stable fishing machine with twin 454's to get us home safe. It has been professionally maintained for your safety as well as the safety of captain and crew. I only use what I consider to be the top notch fishing equipment in the industry today (Shimano)- always a matter of opinion. Using high quality equipment allows for a better experience when trying to reel in these hard fighting fish! Why choose Captain Jake? I think the answer is simple- I'm going to work very hard to ensure you/your friends/family have a safe and enjoyable experience out on the water. Catching fish is what everyone wants but what happens when the fish are not biting?? Did you just waste your money/time/book the wrong captain??? I work hard to provide every charter client the best experience on the water and if my clients feel I could have done more I'm willing to take every step to ensure they feel like they received the enjoyment they were hoping for when they booked their charter with me. Like all licensed captains I maintain my CPR/First Aid certificate and participate in the MCBA random drug screen program. Good standing member of Michigan Charter Boat Association. We have/follow a zero tolerance policy for drugs aboard Fishmael III. However, unlike most other captains I also co-own and operate a small family practice in Montague, MI as a licensed Physician Assistant and have been practicing since graduating from Central Michigan University in 2001. Fishing Lake Michigan has really become a passion of mine and I hope to share some of what I love and enjoy with you- so give me a call and lets talk fishing. 231.740.3693 I welcome families to join me for a fun-filled day of fishing! Children above the age of 6 welcome- must be accompanied by parent/legal guardian. If fishing is not your thing but you would like to spend a day on the water and you don't own a boat, well give me a call to set up a family boat day. Ladies: fishing is not just for guys! If your interested in a ladies fishing day let me take your group out and my wife will first-mate. My wife has 6 years of salmon fishing experience and has been fishing tournaments with me since 2011.